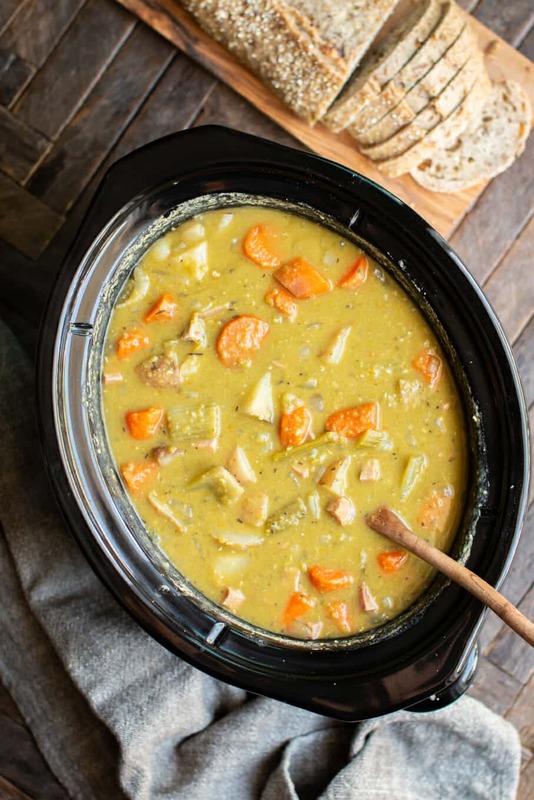 Chunky and flavorful Slow Cooker Spilt Pea Stew is satisfying dinner! Hi all! 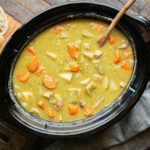 Do you love split pea soup? 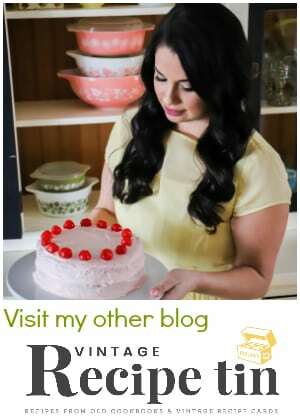 I’m guessing you do if you clicked to get here to this recipe. 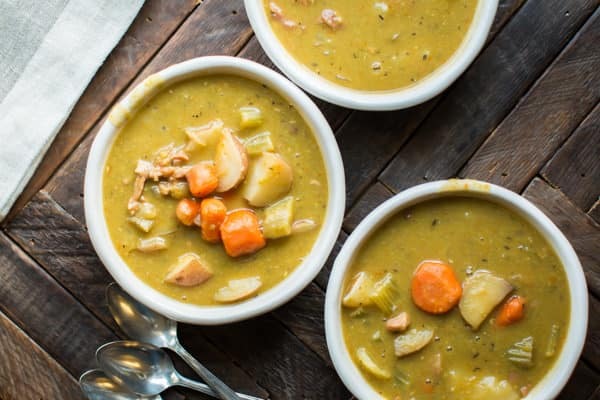 I love split pea soup, but it seems not quite enough to be a complete meal. 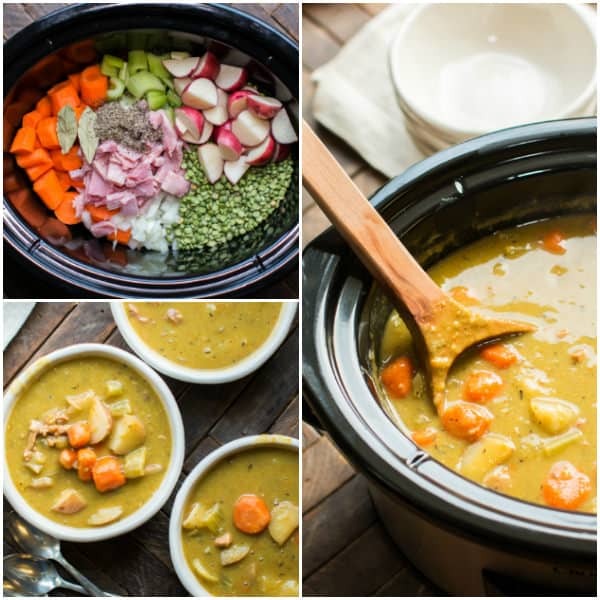 I added loads of thick cut veggies to my classic split pea recipe and made it a thick and satisfying stew. 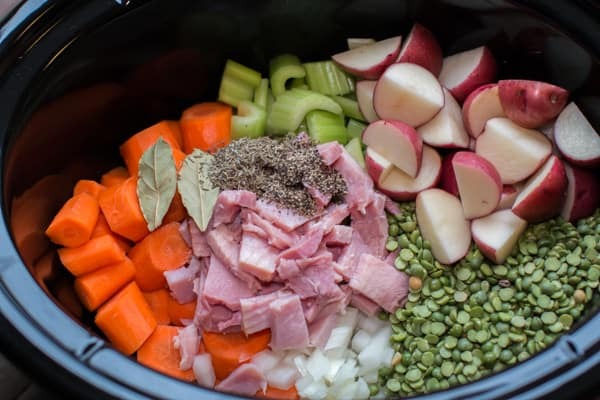 This recipe is great for using leftover ham, and if you have a leftover ham bone, use that too in this recipe. 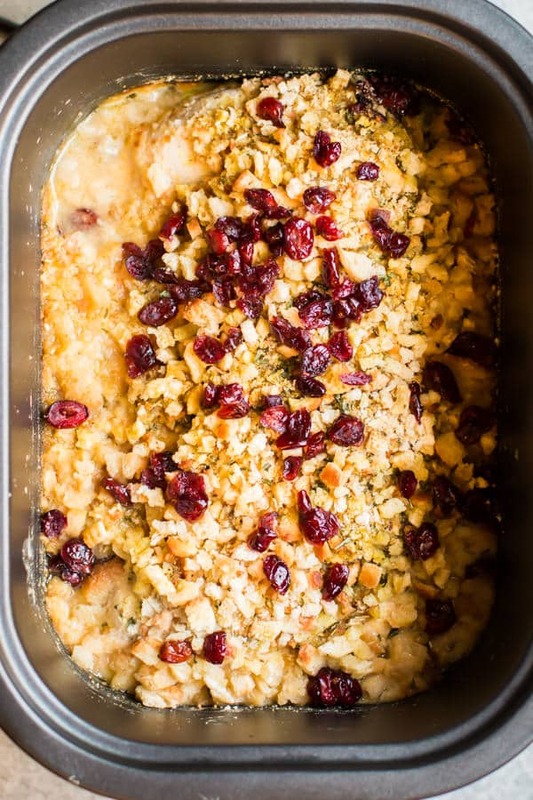 I had tons of leftover ham after making my Slow Cooker Apple and Clove Ham, that leftover ham worked great in this recipe. 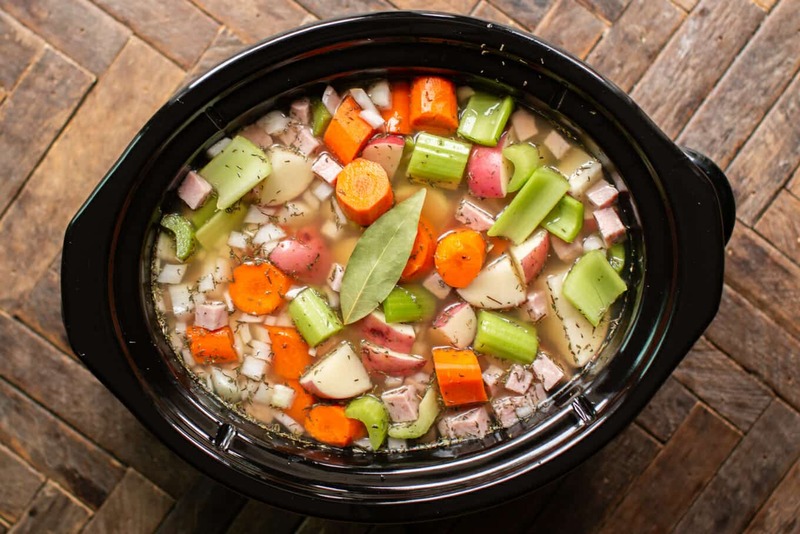 In addition to the split peas, ham and veggies I add bay leaves, black pepper and dried thyme. I can’t make split pea without dried thyme, it really makes the flavor of the split peas pop. Make sure to use the dried leaf thyme, not ground. I also add 7 cups of chicken stock, this may seem like a lot, but it’s just the right amount for the peas to melt into to and have enough broth for the veggies without being too thick. I was pleasantly surprised how good the potatoes tasted in this soup, a match made in heaven with the creamy peas. This is my new favorite soup, I can’t get enough of it! 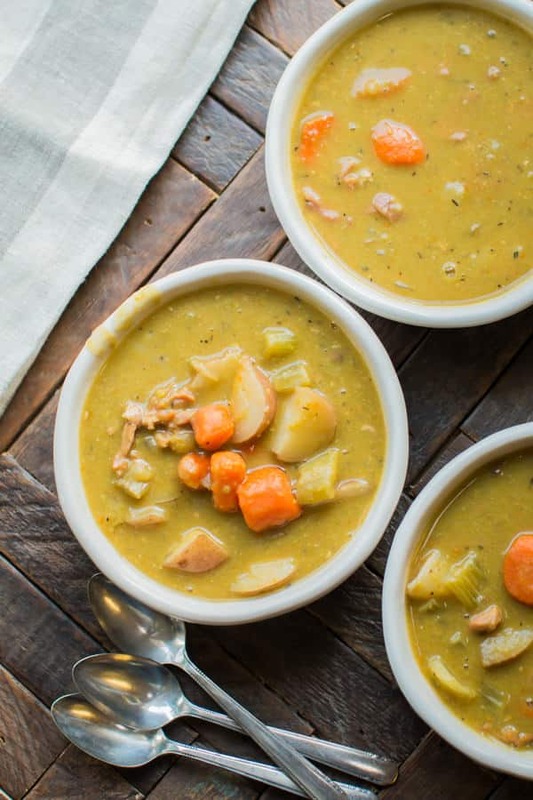 Though my 7-year old wouldn’t touch this soup with a 10 foot pole, I think some day she’ll come around to love split pea soup as much as my husband and I do. Have a great week and a good holiday weekend. I’ll be back full-time adding recipes on Monday. Cover and cook on LOW For 8-9 hours, without opening the lid during the cooking time. When the cooking time is up remove and discard ham bone (if used) and bay leaves. Stir the soup gently until the spit peas melt throughout the stew. Recipe values are approximate, please use your own calculations if you require a special diet. Vales are for 1/10 of recipe. 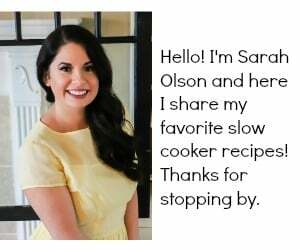 I used my 6-quart Crock-Pot® slow cooker for this recipe. I made this soup and the peas are not softening. I have now cooked it for over 9 hours. Any ides? Did you leave the lid on the entire time? I don’t know why they wouldn’t soften, unless they were old. I just read online that peas in bins don’t soften as well as peas in 1lb bags. Just some ideas. 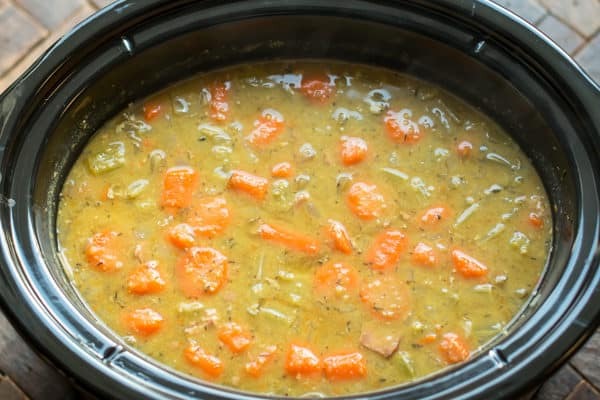 Soak peas in water overnight then drain to get rid of water, before putting peas in slow cooker. Green. We have two here, but rarely use the orange kind. 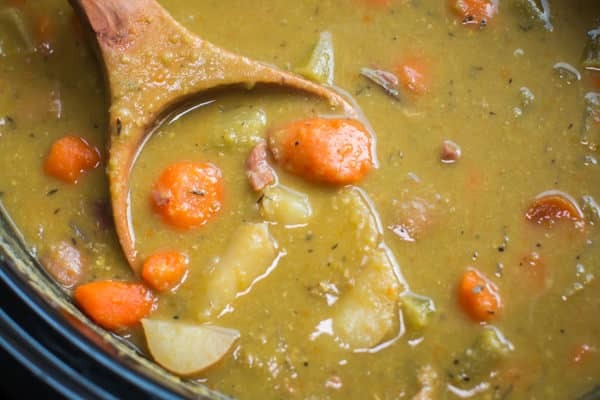 if you like this – you’d love Newfoundland Pea Soup and Dumplings! It’s almost the same! I bet you could cook the dumplings right in the slow cooker as well, as traditionally they are cooked on top of the soup before eating anyways. Delish. 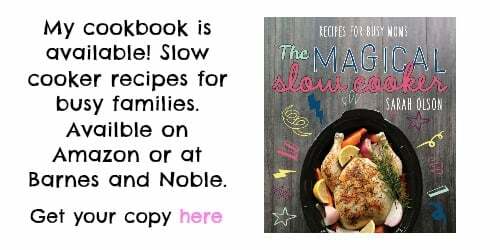 Oh my goodness Niki, I’ve never heard of that, but now I must research and make it in the slow cooker. Thank you so much! probably about 6 hours on high. thanks for the tips. I’ve never thought of that! I wonder if beans are the same. My recipe is similar except I don’t add onions or carrots because the peas are sweet enough on their own. Instead I add about half a head of garlic only. Doesn’t taste garlicky, just super robust and mellow. No chicken broth of if us a ham bone either. Same reason, too much sweetness. Thankyou so much for the tips! 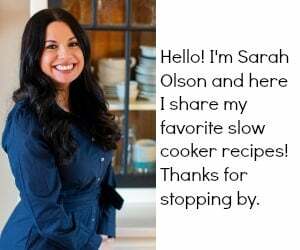 Hi Sarah I’m looking forward to making your Slow Cooker Split Pea Stew real soon and my husband was looking on with me and he wanted to know what kind of bread t that you are showing in your pictures he thought it look good.? I made this yesterday. Cooked for 8 hours, stirred and it was perfect. Peas were soft and everything was blended well. I found that it did not have that good “pea” taste – I’m thinking the chicken stock took that away. 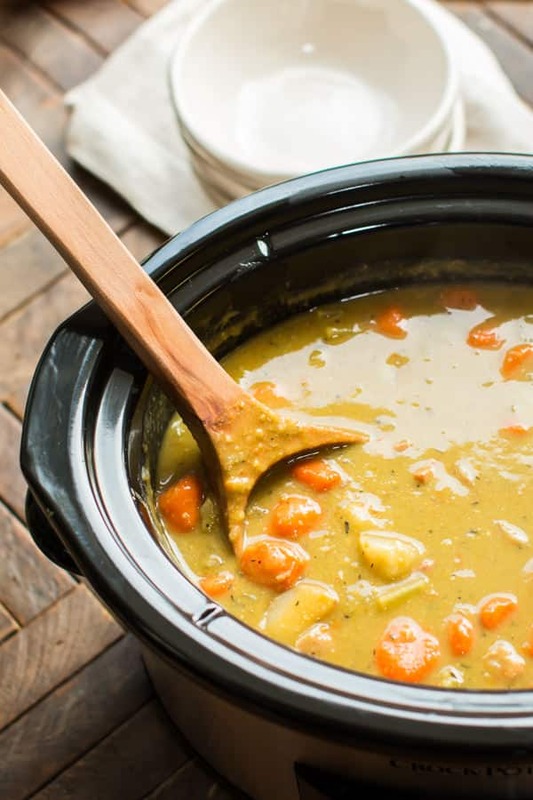 Wondering if it would be better if you just used water like I do my regular split pea soup on the cook top. Other than that, it made a great meal. You could do water, and add salt to taste at the end of the cooking time.